On the 6th April 2016 the MHRA issued a letter to all THR holders on PAs. 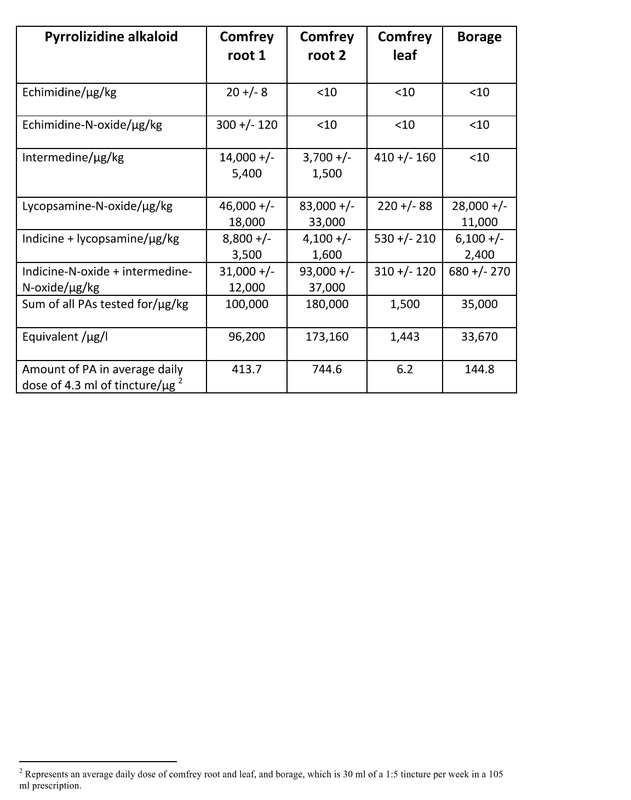 It stated the need to meet new thresholds of PA (Pyrrolizidine Alkaloid) ingestion laid down by the HMPC of 0.35 μg a day. It also stated that the German medicines regulator BfArM is currently defining a maximum threshold of 1.0 μg PAs maximum of daily exposure as a transitional measure. “The main approach for risk management of the PA contamination of herbal medicinal products should be according to the concept of ALARA, i.e. as low as reasonably achievable. In principle, contamination of herbal substances with PA containing weeds should not occur at all (our italics) for reasons of requirements on pharmaceutical product quality and compliance with GACP/GMP. However, based on toxicological considerations and the current guidelines for risk assessment/management of genotoxic carcinogens, a contamination level leading to a daily intake of maximum 0.35 μg PAs/day (life-long exposure for a person with a body weight of 50 kg) is considered of low safety concern. In addition Chris Etheridge, President of the College of Practitioners of Phytotherapy (CPP) wrote a paper on PA toxicity which we attach here and his presentation recently given at the BHMA conference is also available to view on the internet – Pyrrolizidine alkaloids – British Herbal Medicine Association. In view of the strong opinion from experts across the board that PA (Pyrrolizidine Alkaloid) containing herbs should not be prescribed internally by herbal practitioners and the increasing scientific data showing long term risks of developing cancer and veno-occlusive disease from PA intake, the RCHM and all other Professional Associations that comprise the EHTPA, have concluded that for now we should advise members not to prescribe any PA bearing herbs internally. As not all herbalists are members of the EHTPA they may ignore the ban, therefore if you wish to be sure about not being given PA (Pyrrolizidine Alkaloid) containing herbs internally in any form then you may want to use this consent form.